Leading Manufacturer of pressure die casting parts and die casting from Noida. 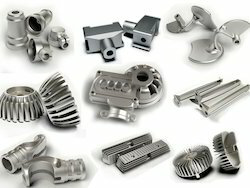 We are passionately betrothed in offering a qualitative collection of Pressure Die Casting Parts. The offered spare parts are precisely manufactured with the superior quality raw material and cutting edge technology in compliance with the set industry standards. These spare parts are checked against numerous quality parameters by our quality examiners to ensure their quality. With our expertise in this domain, we are able to offer a superior quality range of Die Casting. These are manufactured using high grade raw material that conforms their compliance with the industry standards. The offered products are widely used by varied industries for different purposes. Our products are checked on varied parameters by the quality auditors in order to provide a flawless range to the clients.